FP Transitions defines financial advisory organizations using specific terms such as “books,” “practices,” “businesses,” and “firms.” We use these terms precisely in order to offer tailored advice as we discuss different areas of growth and sustainability, even different exit strategies at or near career end. We see a “job/book” as a single-producer (often under someone else’s umbrella) with no operational resources to upkeep and with cash flow tied entirely to individual production. A “practice” is a step up in so far as it involves a basic infrastructure of resources, but is still a single-owner enterprise with cash flow and operations depending on one single advisor and his or her support staff. “Businesses” and “firms” aren’t just bigger, they’re stronger and built for durability. They have foundational elements in place supported by a team of people and more sophisticated compensation and reward systems, including equity pathways for next generation advisors. These enterprises focus on profitability and sustainability, and then consider the best way to grow the top line of the P&L. The biggest difference between a “business” and a “firm” is the level of sustainability achieved – firms are working on or have implemented their third generation of ownership and have fine-tuned their entity structure and compensation systems, which support strong profitability and growth rates. From our experience and observation, we believe that about 70% of advisors own a book, about 25% own a practice, and only about 5% actually own a business or a firm. Transforming your book or practice into a profitable business – something capable of working for you, protecting and realizing the value you’ve built, and serving your clients for their lifetimes – isn’t about working harder. It is about working with surgical precision on certain structural elements that support strong, profitable growth. In other words, if you want to grow, you don’t start by putting more bricks atop the upper floor, you develop a plan or blueprints and usually start with a focus on building the foundation to support the new upper floors. The foundation of a strong, valuable, fast-growing business lies in reinforcing–or rebuilding–your organizational structure, entity structure, and compensation structure. These three business pillars work together to support strong, profitable growth that in turn attracts and retains next generation talent that can help you perpetuate your business and permit you to retire on your terms when you’re ready to do so, leaving a legacy for your next generation advisors to carry on. The most valuable and enduring business models now emerging in the independent financial services industry are those built for strong, sustained growth, as illustrated in the graphic below. This equity-centric model involves advisors working under the umbrella of a single enterprise, sharing not only support staff and expenses, but also clients and success. Enterprises with this model have equity strength that others do not. Instead of individuals working alone to build a book, this organizational structure is designed to focus the efforts of a collegial and collaborative team all working together to build a business – something bigger, better, and stronger than any one person could hope to build alone. 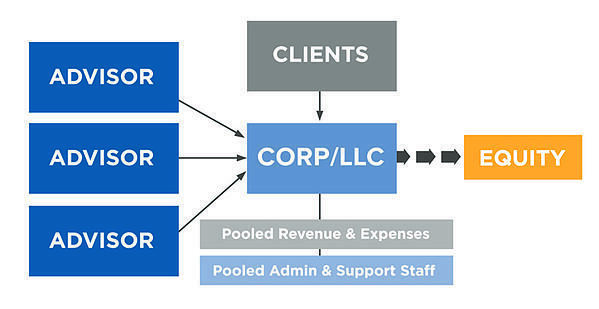 As an independently owned business, this model relies on a strong, centralized organizational structure. The entity collects all incoming revenue (assigned from all the receiving producers/financial advisors), pays out compensation (wages and benefits) for production and work performed, and then settles operating expenses. Controlling all income and overhead items results in a bottom-line profit, which in turn provides each equity partner with two essential results: 1) a return on their investment, and; 2) the means by which the younger, investing advisors pay for that continuing ownership opportunity. The resulting competitive wages and equity stake are why and how next generation advisors invest in a more valuable business rather than building their own individual books. The framework for a strong, fast-growing business generally relies on the correct entity structure, such as a corporation or a limited liability company (LLC). An entity structure creates an investable asset and supports building equity pathways to help retain next generation talent. A proper entity structure also allows for a more sophisticated ownership-level compensation system that aligns top and bottom line goals. In short, there is no substitute for a well-structured entity if you want to build a multi-owner, multi-generational business. Another significant benefit is that an entity structure separates your personal affairs from your business affairs, restricting the liabilities and obligations of the business to the business. While a legal entity generally does not provide you with liability protection for negligent investment advice, a corporation or LLC provides a layer of protection between your personal assets and the liabilities that result from business obligations. A limited liability entity can shelter you from such things as contract disputes or disputes with vendors and suppliers, liability associated with an employee, and injuries to clients and others visiting your office. Simply stated, building a book or a practice requires a focus on revenue production. Building a business requires past and future leadership to make the connection between a growing cash flow stream and the costs of such growth – in other words, a focus on the bottom line as well. The process of rethinking the ownership level compensation strategy isn’t about making things more complicated. In fact, the opposite is almost always true. Creating a predictable and sophisticated compensation strategy for the ownership team reflects the philosophy that owners of small, but growing businesses are not motivated solely by a pay check or a bonus, but by increasing the size and share of their profit distributions and a corresponding increase in shareholder value. As you look to the future and continue to grow revenue, perhaps with your sights set on doubling in size in the next 10 years or so, you will need a compensation system that does not also double the amount paid out to advisors or producers. If the goal is to build an equity-centric organization that next generation advisors (perhaps your son or daughter) want to invest their time, money, and careers into, future growth needs to power a sufficient level of profitability to warrant an advisor taking the risk of buying into your business rather than just working for a larger and larger paycheck. Implementing a professional compensation system early in the process can ensure that the growth is efficient and effective in building a strong, profitable business, and not a group of well-paid book owners who one day open up shop across the street and compete against you. These three support pillars necessarily overlap and evolve in relation to each other. As one structure is strengthened, it encourages and enables the growth of the others. In this way, building a strong foundation is an integral and organic process. To successfully reinforce, or rebuild, these three foundational pillars, start with an informed plan. At FP Transitions we start the plan development process with our advisory clients by taking time to thoroughly assess every detail of the practice that you want to transform into a business. We ask a lot of questions, explore many ideas, and listen to your plans and goals before ever telling you what we think. It's impossible to give good advice without learning and listening first. Before you take a hammer and a wrench to your current practice model underpinnings, take a little extra time to figure out what you need to do, the order in which the tasks are best addressed, and how to accomplish the necessary work with minimal disruption to your already busy day. In our newest white paper, Transforming Your Practice into a Business, we ask advisors to answer one important and challenging question: What do you want your business to look like 10 years from now? Simple mathematics suggests that if you continue to grow at around 7% a year, in ten years your business will double in size. That kind of growth means that you will need more people, more talented and younger advisors and support staff to help you build and run the business. Setting up an entity structure allows you to create an equity opportunity, allowing next generation advisors to invest in a career rather than just working a job. The correct organizational structure helps to ensure that your new hires understand that it is much smarter to be an equity partner in a strong, valuable, and sustainable business. A multifaceted compensation structure provides monetary incentive while allowing you to reward work and commitment to the business. Your people support the growth of a strong business, and a growing business supports the recruitment and retention of talented people. Start a dialogue with your next generation advisors and begin the process of building now. Ask the tough questions. Think about what you want to build and what you want your business to do for you, your clients, and your staff, and make plans to start putting the foundations in place today.